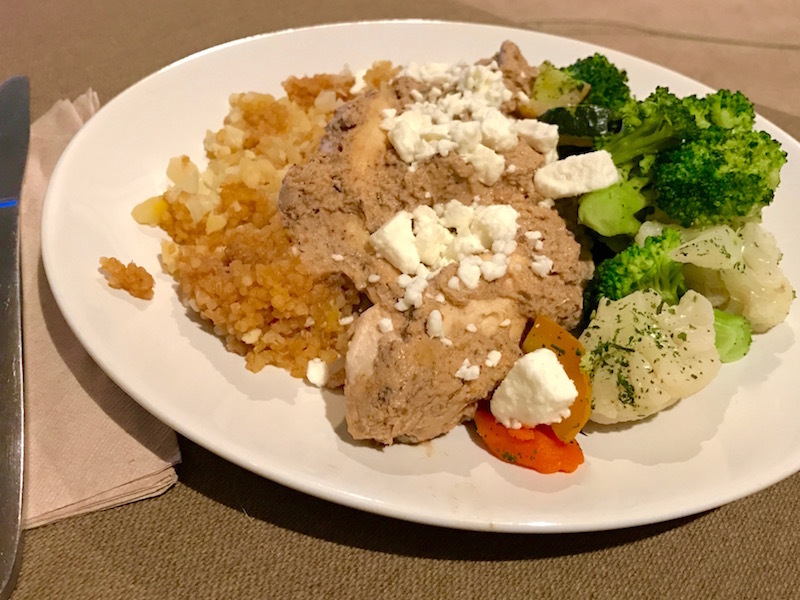 Chicken with Mediterranean Sauce | Keep It Up, David! I made a flavorful sauce the other night, and I’m calling it a Mediterranean sauce because it uses pretty much all the Mediterranean flavors. All of them. 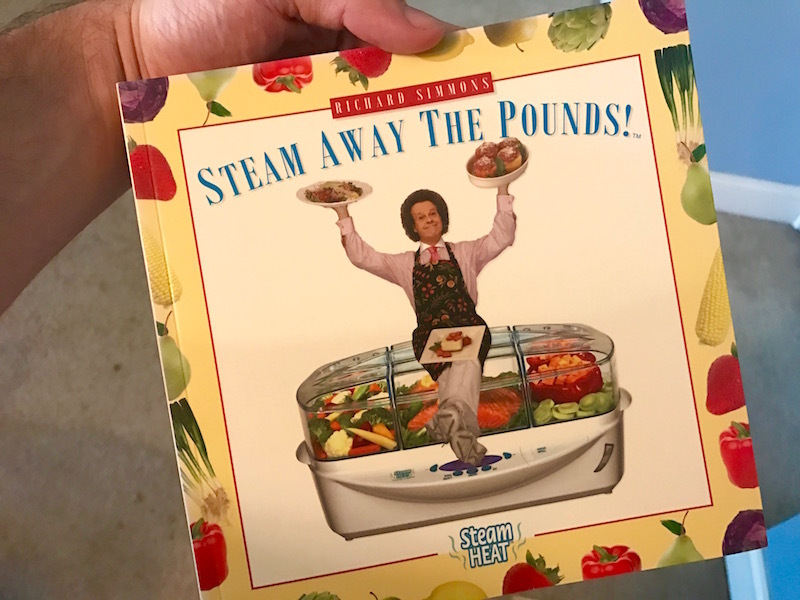 My recipe was inspired by a recipe in Richard Simmons’ Steam Away the Pounds cookbook, which was published as a companion to his Steam Heat electronic steamer. Even though it premiered about 10 years ago, I finally bought a Steam Heat last month and I’ve been using it regularly. Richard’s recipe is actually a marinade, but I added a few things and thickened it up, taking it from marinade land to sauce country. 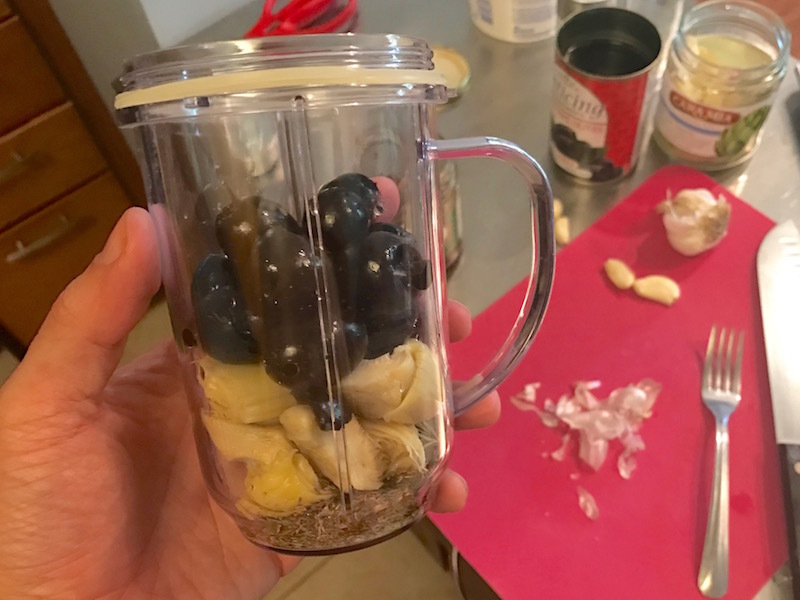 Get out your blender or food processor. I used my Magic Bullet, which was the perfect for this recipe, which makes enough sauce for two people. Check out all those Mediterranean flavors! 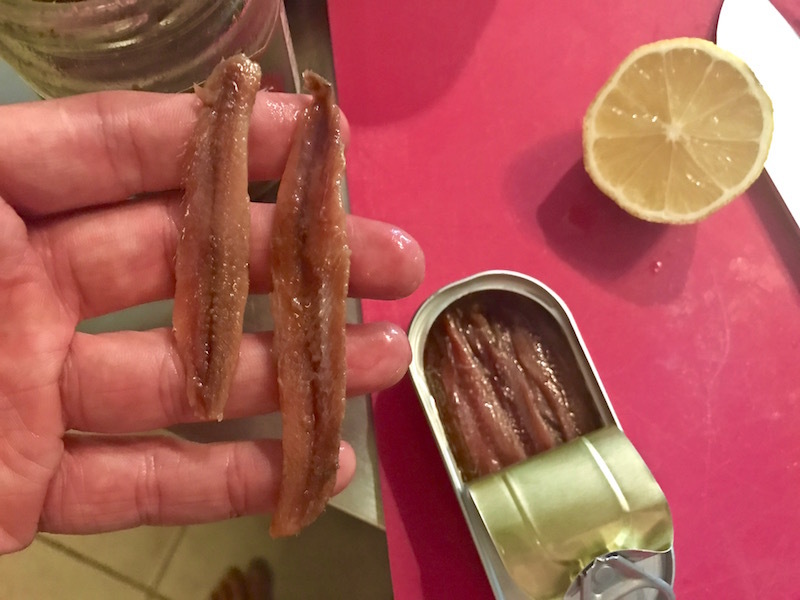 I bumped up the Mediterranean factor even more, by adding one cup plain nonfat Greek yogurt and my secret ingredient: three anchovy fillets. This adds a fantastically complex, salty, briny flavor, but it doesn’t make the dish fishy at all, because I only added a little bit. (Plus, I got to eat the rest of the tin as a little appetizer, so that was a fun bonus!) I know some people have aversions to anchovy or fish, but my friend Jen ate this dinner with me, and she doesn’t eat fish, and she liked it. So there. Anyway. You blend it all together until it’s all combined. 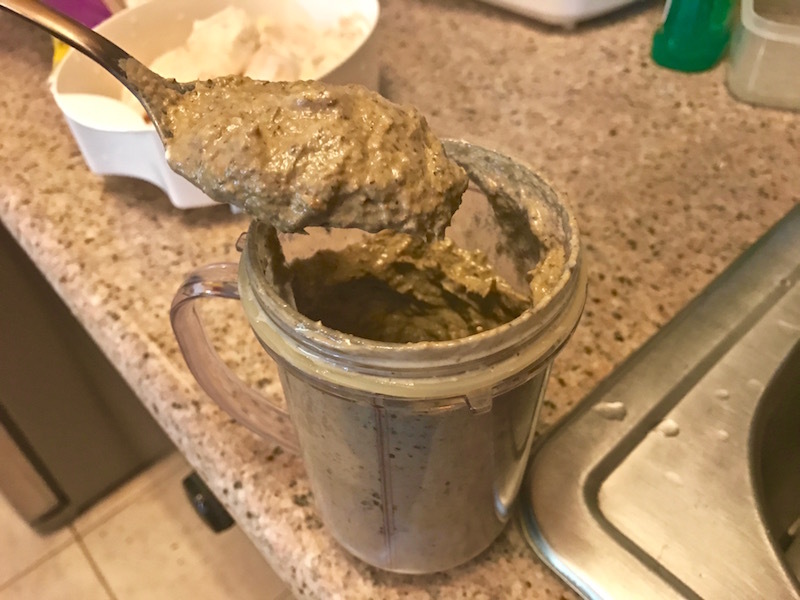 The yogurt will make it thick, and while it’s not the most appealing color, it’s so freakin’ delicious! I covered six raw chicken tenders with the sauce, which was so thick you couldn’t even see all the chicken under there. 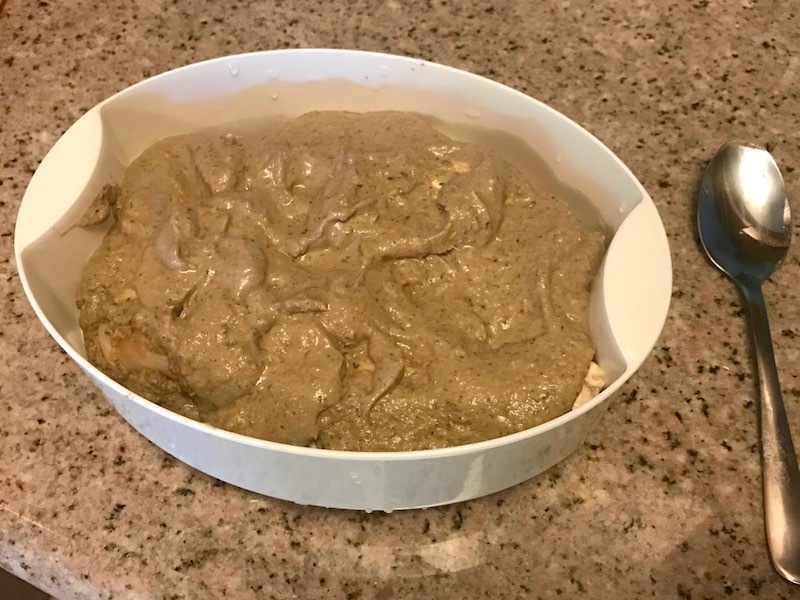 I put it in the fridge for a few hours, so the chicken could soak up the flavors, but you can skip this step. I think it’s a little too thick to serve as a good marinade. I cooked it using my Richard Simmons Steam Heat steamer (it took 22 minutes), but you can bake it, or cook in a pan on the stovetop, if you like. Just before serving, I sprinkled a couple tablespoons of low-fat Feta cheese as a garnish. That’s quinoa on the left, cooked in chicken stock and saffron, with riced cauliflower added to bulk it up. And I steamed a frozen veggie medley on the right as another side dish. You can really taste the olives and artichoke hearts in the sauce, and the herbs and garlic help make it a really flavorful, satisfying dish. I calculated the calories for the entire plate (including the quinoa and veggies), and my whole meal was 530 calories. 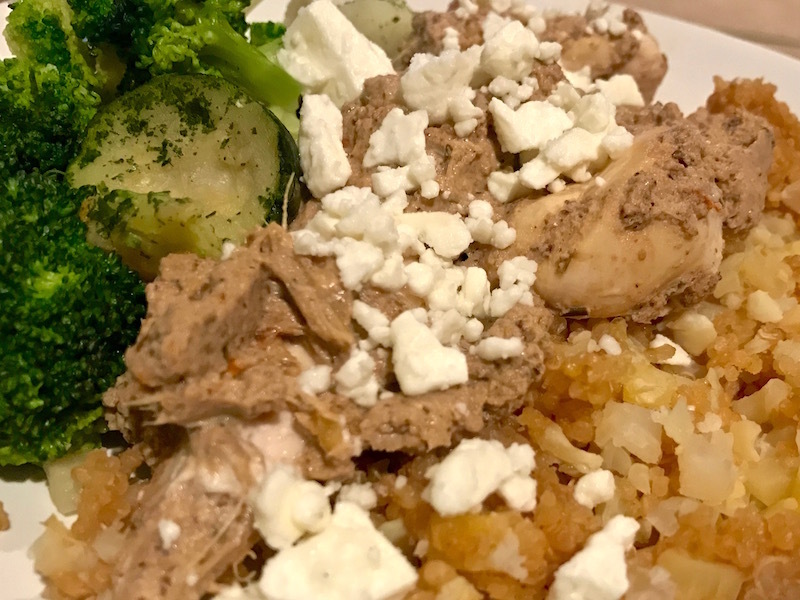 I know the quinoa had 170 calories by itself, and the veggies are super low in calories, which meant the chicken and Mediterranean sauce clocked in around 350 calories. A quick, easy, healthy meal option. Who doesn’t need more of those? Check out oodles and oodles of recipes on my Recipes page. This entry was posted on Thursday, December 8th, 2016 at 9:56 am and is filed under Uncategorized. You can follow any responses to this entry through the RSS 2.0 feed. You can leave a response, or trackback from your own site.